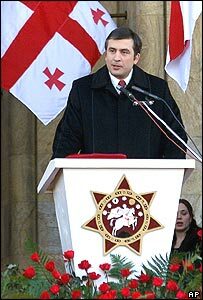 The President of the former Soviet republic of Georgia Mikhail Saakashvili has nominated the new government. Thirty-six year-old Mr Saakashvili is Europe's youngest elected leader, and his new, 15-member cabinet, has some of Europe's youngest ministers. Mr Saakashvili has promised to tackle the government corruption he said was at the heart of many of Georgia's problems. The new government line-up has yet to be approved by parliament. President Mikhail Saakashvili says Georgia's new government will be the most progressive in Eastern Europe. Most of the 15 cabinet members are in their thirties, many have been educated in the West and were active participants of the rose revolution that ousted former President Shevardnadze in November. The nominees, four of whom are women, are expected to be approved by the parliament this week, in a procedure that analysts call a formality. The new cabinet is already drafting a plan of action on how to put an end to the country's endless problems. Half of the population of Georgia lives below the poverty line, security is fragile and state coffers are empty. Critics are sceptical on whether Georgia's young government has enough experience to tackle the problems. But President Saakashvili promises change. Rampant government corruption has been at the heart of Georgia's socio-economic problems, with billions of dollars of foreign aid and investment going straight into the pockets of Shevardnadze-era officials. Many of these officials are now in jail. This, Mr Saakashvili says, should serve as a warning to the ministers. "Don't take bribes and don't give jobs to your relatives," was Mr Saakashvili's first advice to his new team. "And if you do, you will go straight to prison," he added.